I am a massive fan of J. K. Rowling's Harry Potter novels, and the thought of reading anything else by her scared me, which is why The Casual Vacancy has sat unread on my bookshelf for more than a year now. But for work purposes, I decided I really needed to read her first novel as Robert Galbraith, The Cuckoo's Calling, before the second one, The Silkworm, was released. And in doing so, I discovered I had nothing to be scared about (at least not when Rowling is writing as Galbraith). Private detective Cormoran Strike isn't exactly having the best time. He's broken up with his fiancee, losing his home, and his business isn't doing too great. On the same day a new temp arrives at his office - the unassuming and fiercely intelligent Robin Ellacott - Cormoran is hired by the brother of a troubled model who fell to her death from the balcony of her home. Everyone assumes it was an accident, but Lula Landry's brother is convinced foul play was involved. Full disclosure from the off, I only got three quarters of the way through The Cuckoo's Calling before I had to abandon it to read The Silkworm (my review of which you can read here). That was really annoying, because as brilliant as The Silkworm is, I was so caught up in this novel that I really wanted to know who murdered Lula Landry. For me, all the characters were suspect, and I couldn't work out whodunnit. 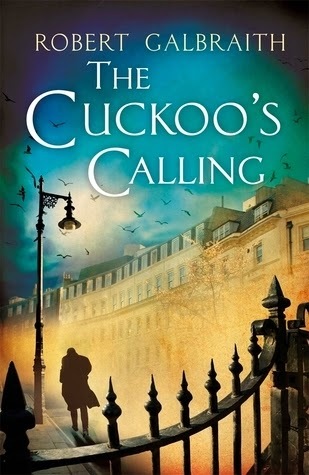 There are plenty of twists and turns in The Cuckoo's Calling, perhaps one too many, but I loved the old school detective novel style Rowling adopts, with Cormoran working out who the murderer is before the end, and then leaving you in suspense for a number of chapters. It's very Poirot or Marple, and I really enjoyed it. I also really enjoyed the relationship between Cormoran and Robin - it starts out with both assessing each other and slowly moves into a solid friendship based on mutual respect. There is a hint of attraction there (more from Cormoran towards Robin than vice versa) but this is very under the surface, and I like that Rowling doesn't dwell on it. Rather, Cormoran and Robin are more Harry and Hermione than Ron and Hermione (I couldn't have written this review without at least one Harry Potter comparison). Despite never being able to forget in the back of my mind that I was reading the work of Rowling, I was swept away in The Cuckoo's Calling, and found it a grown-up read, which was both a great murder mystery and a fabulous novel about two compelling characters who are very, very different. The Silkworm has proved that The Cuckoo's Calling is not a one-hit wonder, and with plans for plenty more Cormoran Strike novels, we could all soon stop identifying Rowling by Harry Potter. Okay, maybe not, but we'll identify her by more than just Harry Potter. I enjoyed this one too. I couldn't work it out either and I enjoyed the old fashioned detective pace. I remember you being one of the first to read this, before it was revealed to be Rowling! Have you read The Silkworm yet?